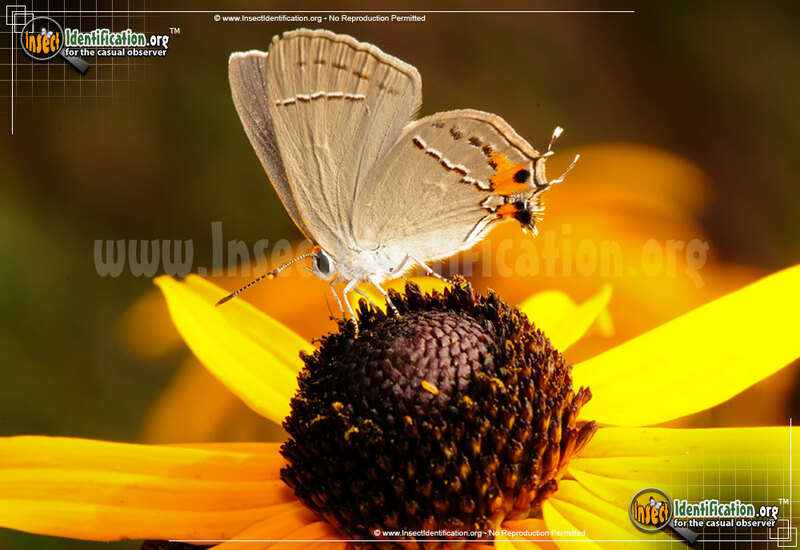 Detailing the physical features, habits, territorial reach and other identifying qualities of the Gray Hairstreak Butterfly. The small Gray Hairstreak Butterfly can be found all over the continent, flitting and flying in dizzying patterns. Adult Gray Hairstreak Butterflies can be seen in open fields, parks, woods and gardens in every state and province. When resting, they bask in the sun with their wings stretched open, a behavior that is uncharacteristic in other Hairstreaks. When in flight, they are fast, using an array of flight maneuvers that make it difficult visually track. This is probably helpful in avoiding an airborne attack. Adults are a light gray with a thin, short tail at the bottom of each hindwing. A crisp black/white line stretches down the inside of each forewing. A secondary row of black dashes runs closer to the edge and ends in a splash of orange at the bottom. Each orange patch has a black dot and is visible on top and underneath the wings. The hair-like fringe extending from the bottom of the hindwings also has orange patches with black inside them. The top (dorsal) side of the wings are almost completely gray save for the orange/black pattern and white dashes between them. The caterpillar of the Gray Hairstreak feeds on the flowers of legumes and member of the hibiscus plant family. This makes it an annoying pest to bean farmers and ornamental flower growers. The butterfly can adapt its coloring (to a certain degree) and camouflage itself on the plant it is feeding on. Two to three generations are born in a year which likely aids in their prevalence. They are most active from late spring to early autumn.